The idea is that bees will land on the paper, grab a glucose snack—similar to what beekeepers feed their hives to help them survive the winter—and fly away. The company describes the paper as being "like an energy drink for bees" to help them fly farther on their journeys to find food. 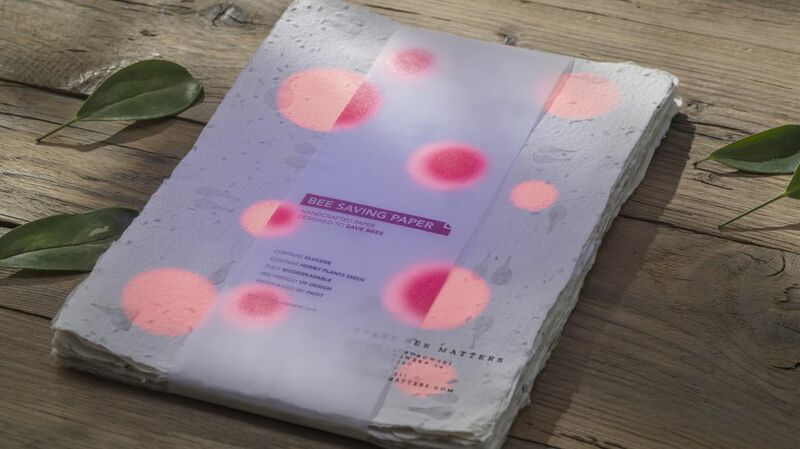 As counterintuitive as it seems, the paper is designed not to be used and recycled, but left out in nature. The paper will eventually fully biodegrade, leaving behind seeds that will grow into the kinds of flowers bees love. The paper could be used in paper plates, bags, coffee cup sleeves, or other disposable products (though the creators don't really say how that might work—would the bees come up and land on your coffee cup?). A Polish beekeeper named Łukasz Kaczorowski is already using it for honey-jar labels.